This fall and winter I’ve been seeing cut out boots everywhere. At first, I wasn’t into the trend but I’m turning around. They keep your feet warm but also not too hot. Have you ever gone to the mall and decide that it was a good idea to wear big boots because it’s cold outside? Then you get to the mall and realize that it was the worst idea ever? I know this sounds like a silly problem but I’m sure a few of you have done it. Plus, these boots are way more stylish than my DIY Yeezy Boots I made last year! 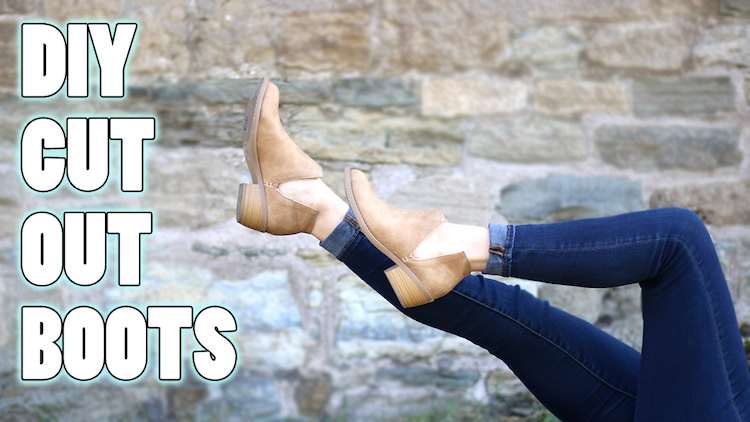 I picked up these booties at a 2nd hand store for around $10 and turned them into the perfect cut-out boot. As mentioned in the video I suggest looking for a pair of boots that have an elastic side as it will allow you to cut the boot a lot easier. Other than a pair of boots, you’ll just need a pair of scissors. Now that I have this pair and have seriously been wearing them EVERYWHERE, I might have to DIY some more boots! Watch the video below for the full tutorial! Don’t forget to Subscribe to my DIY YouTube Channel!